It is indeed a happy accident, that my arrival at ANZAC biscuits in the Edmonds Cook Book as I head forth in my self-imposed Edmonds Challenge has coincided so closely with ANZAC Day. ANZAC Day always puts me in mind of Aud and Reg, my Granma and Grandad on my Dad’s side. Along with many others, my grandparents were part of World War II. Grandad went away with the Royal Air Force, and Granma was a WAF. The milk bottle in the picture above was once theirs, and I used it in a little homage to them. 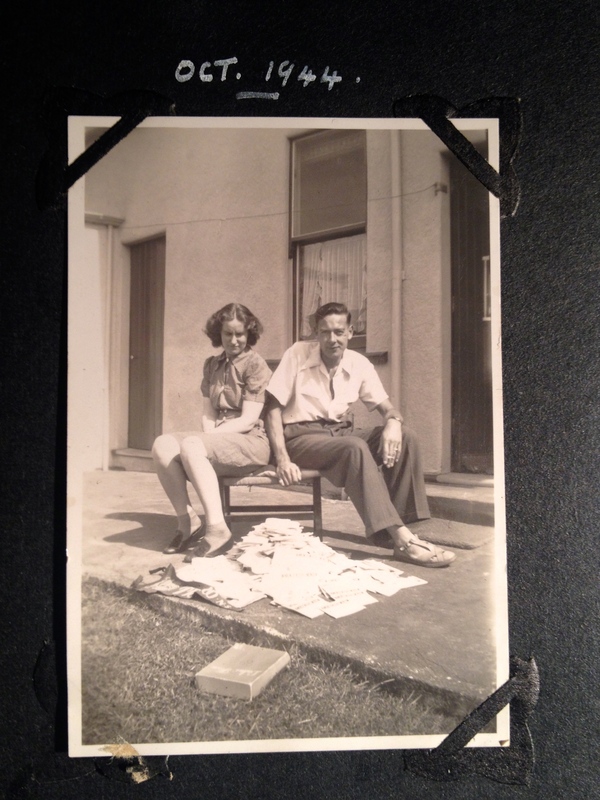 Here’s a photo of Aud and Reg below; I think from my Grandad’s cryptic title (“four years ‘ard labour”) and the pile of paper in front of them, they are sitting in front of all of the letters they exchanged while Grandad was abroad. He looks rather Don Draper, although that’s where the comparison ends…he was a most morally upstanding man and a teetotaller to boot. 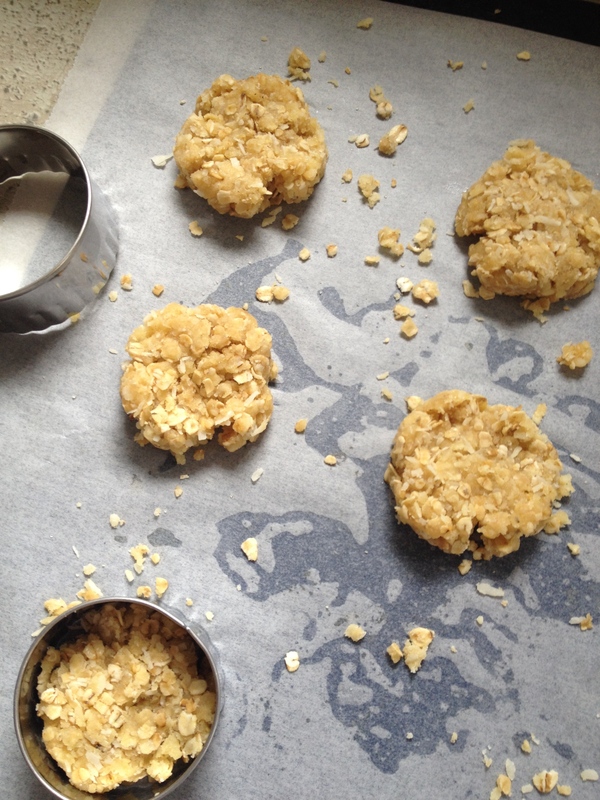 ANZAC biscuits enjoy a historical pedigree dating back to World War I, where their ancestor-biscuits of oats, golden syrup, sugar and four were sold at fetes and galas at home to raise money for the troops. 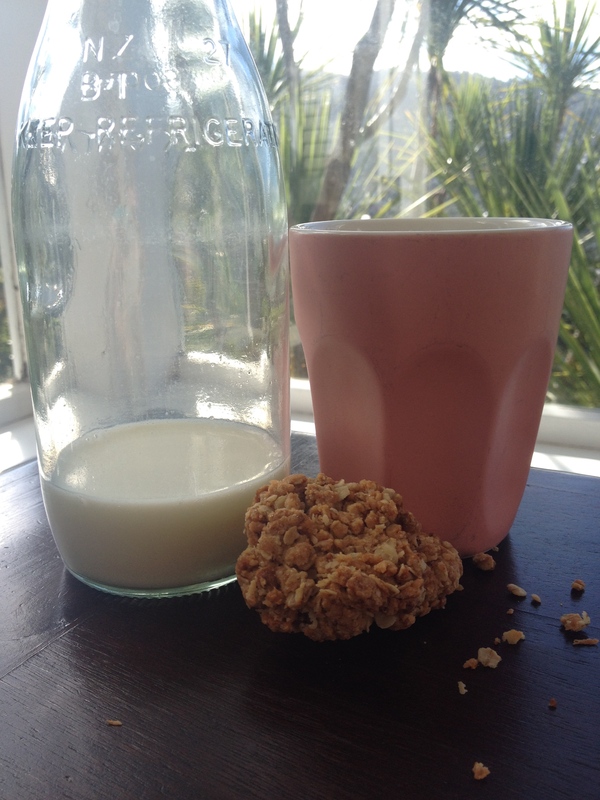 After Gallipoli the term ANZAC was born, and the ANZAC biscuit followed, first appearing in a cook book in 1921. Heat the oven to180 degrees Celsius. Mix together the flour, sugar, coconut in a large-ish bowl. Melt together the golden syrup and butter (I did this in a little dish in the microwave). Dissolve the baking soda into the water and add it to the butter and syrup. It will bubble and fizz in an awesome kind of way. Mix the butter mixture with the dry ingredients and place tablespoonfuls on a cold, greased tray. I must confess I used a cookie cutter to shape them; I’m sure this is not authentic, but I had some new cutters and I was looking for a chance to use them. Bake for 15 minutes or until they are golden and crispy. Yummo! I love ANZAC biscuits. What a fantastic photo of grandma & grandad, I’ve never seen that one before. I’m sure they’d be proud. Thanks lovely! I found the photo in one of those albums I have that Grandad put together with his war pics. Love how his look is back in fashion!